Cultivating the Mind: What makes a criminal? I want to examine how society turn people into criminals. People who break the rules and convicted of a crime are labeled as criminals. What does it mean if a country has a large population in jail? Does it mean the government isn't representing a large portion of the population? Or does it mean a large portion of the country is born bad? Do the people in jail disagree with the law that put then there? Or is there some part of their life that impels them to break the law? Is crime proof the government is failing? Why do people choose to break the law? Is it an easier life for the law breaker? How should we treat someone who makes a mistake? Should a mistake be treated the same as a deliberate act? If it is against the law to kill a person, is it wrong for the law to sentence a person to death? Should people conform to the majority? Has rebellion ever been good for society? Should I stay true to myself? Should I be more grey? Flexible? Understanding? Do laws and punishment teach discipline? What crimes deserve a prison sentence? Is locking people up a solution? We are not alone, a person's life will always be affected by their relationship to others. Social engineering endeavours to build structures for a better society. Laws are made to help create a happy society. 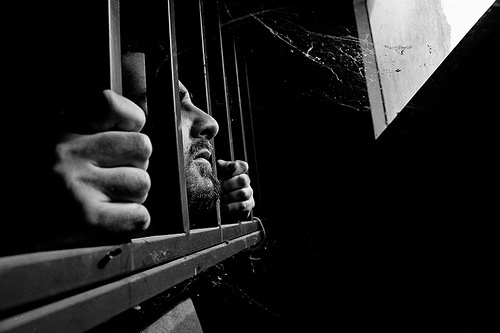 Prisons are one of the ways that society manages people who break the rules. I don't think it is an effective solution. Locking a person away only tries to hide the problem and puts a stigma on the person after release. Here are some questions to help think about the effect prison has on a person. Is people's behaviour a product of their environment? Is criminal behaviour more likely to develop in certain areas? What is common to areas with high levels of crime? Who is responsible for creating a good environment for people to live in? How can a prison help correct a person's wrong? Should the first priority of law be to punish people or improve humanity? Do people end up in jail because they are on the wrong side of power? Is power the best indication of who is right and who is wrong? Is the purpose of being powerful, to decide what is right and wrong?﻿ When is putting a person in jail an effective solution? If you break a leg, do you cut it off, or give it a chance to mend? Is discipline the answer to social problems? Education? Equality? Does a judge follow the rules or make ethical decisions? Who makes the rules? What influence over the rules do I have as an individual? What influence do rules have over my thinking? If power is controlled by the majority what happens to the minority? Is more power given to the wealthy? Has civil disobedience been for the greater good? Should I be pursuing what makes me happy or change what makes me happy? Can I be happy if I ask so many questions? If I leave things as they are eventually through no fault of my own, circumstances will change. How can I remain happy if I'm not flexible? A large part of my happiness is due to, accepting the circumstances and my power over them. Society's solution is to lock criminals away so they can't recommit the crime. This solution, becomes part of the problem because it doesn't teach people how to be part of the community. I suggest the current prison system isn't an effective solution in most cases. We need to look for better ways to deal with social disobedience. If we continue down the same path we can only expect more social injustice. Is our responsibility to punish or educate?